Thank you Canada for choosing Six Cent Press as your #1 trusted premier source for custom made pin back buttons. The wearable magnet button features a strong magnet allowing the button to be worn without having to pierce through the garment. STUCK WITHOUT A DESIGN FOR YOUR PERFECT BUTTON? Our creative dream team is working hard daily on perfect custom button designs! Customized pin back buttons are made to order from your artwork. 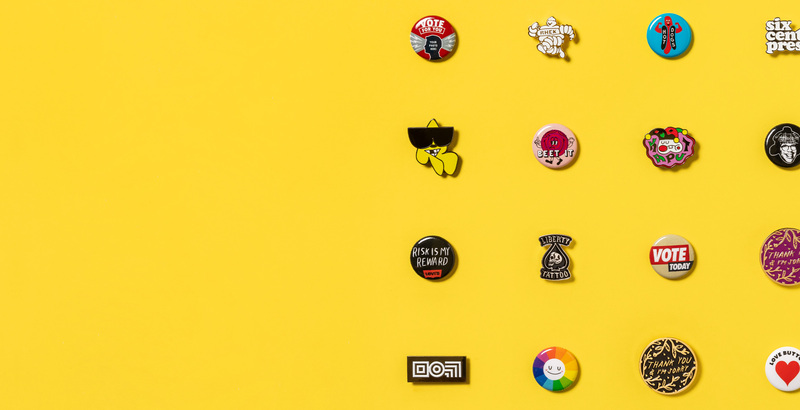 Choose from 13 popular round & shaped button sizes with a metal pinback. Make your message stick with custom magnet back buttons available in a variety of round and shaped sizes. Make your own custom pin back buttons with Tecre brand Button Making Machines, Graphic Punches, & complete Button Making Parts. Our custom-made buttons deliver smiles every time! Check out our process. Six Cent Press customers enjoy lightning fast turn around time on custom button orders, superior products at competitive rates, and dependable customer service.